It’s safe to say the Scribblenauts franchise hasn’t had the best of starts on Nintendo Switch. 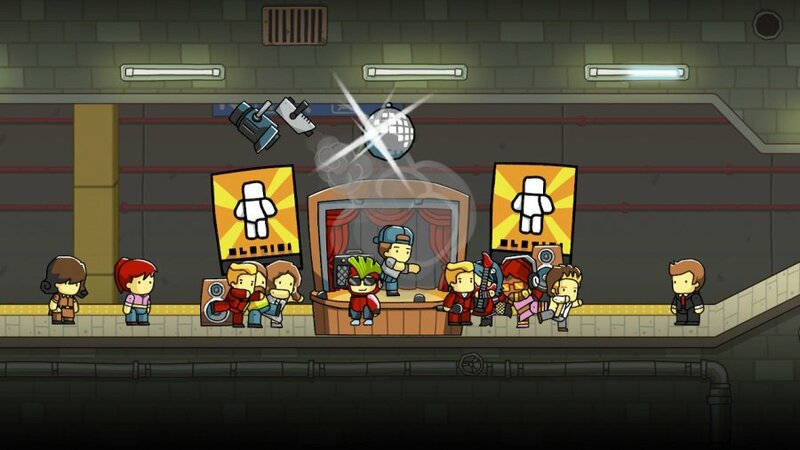 Despite all the charm and charisma in the world, the lifeless Scribblenauts: Showdown somehow took all those likeable qualities, boiled them down to their bare mechanics and packaged them up as a boring party game. Would that be it for Maxwell and his magical notebook on Nintendo’s latest hardware, or could the talented hero put his imagination to good use and doodle up a turnaround? 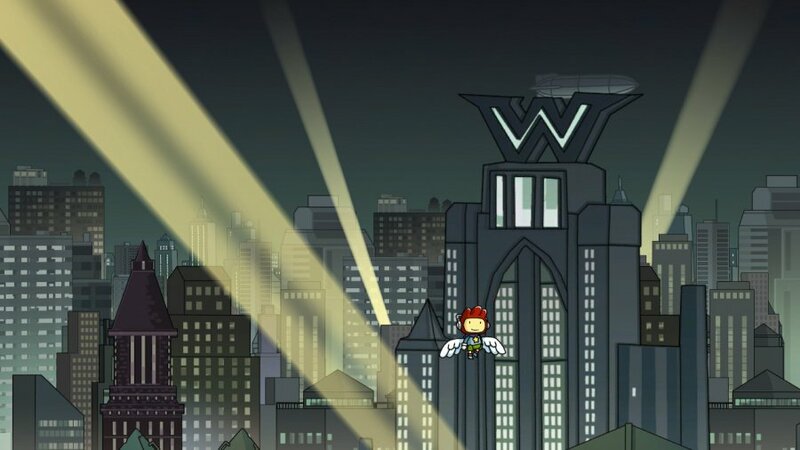 Thankfully, publisher Warner Bros. Entertainment hasn’t been phased by the misstep that was Showdown, as it’s gone right ahead and optimised two of the strongest instalments in the series - Scribblenauts Unlimited and Scribblenauts Unmasked: A DC Comics Adventure - and packaged them together in the Scribblenauts Mega Pack. The creative mix of puzzle solving, exploration and platforming has always shined brightest on Nintendo platforms (Unlimited debuted on Wii U and 3DS, after all) and now Switch users get to put their own imaginations to good use. Despite being an almost-six-year-old game, Scribblenauts Unlimited still represents the series at its quintessential best. The story follows the adventures of Maxwell and his sister Lily, who are bestowed with a magical notebook and an equally mysterious globe by their adventurous parents. The pad enables the user to create anything by writing its name inside, while the globe has the power to whisk you anywhere in the world. However, when Maxwell plays a trick on a gnarled old man, his sister finds her feet have turned to concrete. Now it’s up to our red-helmeted hero to head out into the world and use a collectable resource called Starites to help free her. The result is a side-scrolling 2D platformer full of silly and surprising locations filled with quests to complete. Each one will require you to pop out your notebook and use the left analog stick and ‘A’ to select a letter from a set of radial wheels. As you write out a particular noun or adjective, a series of potential suggestions appear below. Select one and pop, there it is - and it’s just as broad and deep with potential as it sounds. Need to rescue a cat from a tree? Sure, you could create a ladder, climb up and rescue it. Or maybe you could draw wings and let the cat fly itself down. Or how about this - you create a jet plane and you hover over and grab the feline like a 2D Arnold Schwarzenegger. 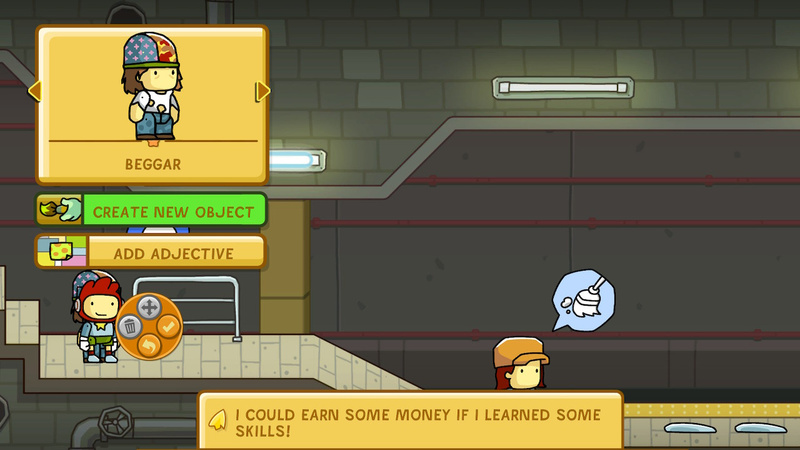 That’s the joy of quests are presented in Scribblenauts Unlimited; there’s just so much scope to how you can solve a problem. Sure, you can’t use brand names or anything adult (obviously), but any game that gives you near-endless imaginative room for creativity is an ideal fit for Switch and its family-friendly ethos. You can use Lily’s globe to visit multiple locations in your search for Starites and Starite Shards and there’s plenty of different tasks to keep you invested. You can make guns and swords to fight time-travelling monsters, or build helicopters to chase flying sky pirates. Even the most mundane of tasks - such as helping an art curator enhance the paintings in his gallery - is no less engaging because you’re always tapping into your own ideas. There are also plenty of hints in place, so younger players won’t struggle for long if they go blank mid-game. And you can pretty much visit its many locations in any order you like, thanks to the map that pops up every time you select the globe from the overlay menu you access by pressing ‘+’/'-'. That ease of navigation makes Showdown incredibly easy to get lost in without ever feeling tied to a linear path. You can even visit the Punctuation Plaza where you can set up a shop and share some of your more unusual creations with other users, or visit their customisable premises are browse and rate their wordplay offerings. 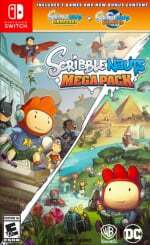 The Mega Pack also comes with Scribblenauts Unmasked: A DC Comics Adventure, a sequel that builds on the approach to creativity perfected in Unlimited and throws in 2,000 DC characters for good measure. Much like LEGO DC/Marvel games, developer 5th Cell really ‘got’ what makes these heroes and villains so timeless and weaved it seamlessly into the Scribblenauts formula. Now you can visit Gotham City, Metropolis and more as you utilise everything from Batman’s batarangs to Doctor Fate’s helmet to solve all manner of comic capers. It’s brilliant, and much more than a simple use of a recognisable licence. The same power to add adjectives to characters and objects returns, so an extra layer of fun comes in as you turn Green Lantern into a zombie or make Wonder Woman a giant version of her normal, lasso-wielding self. This licensed sequel also features a system that penalises you for using the same nouns and adjectives over and over again; if you want better rewards, you’ll need to use that imagination of yours. It’s a welcome twist, and one that suits the higher stakes Unmasked offers. And that’s not to mention the most obscure characters from DC canon that the developer took the time to include just in case some comics aficionado wants to show off their lore knowledge. This new double-pack even includes two brand new locations - Titan Towers and Belle Reve - so those looking to double dip have extra content to chew on. Scribblenauts Mega Pack brings two of the most empowering games of the past decade to Switch. Both have been optimised for Switch - including touchscreen support, although you'll have to dig in the menus to find it - so you can be sure you’re getting a family-friendly experience that’ll have you plumbing the depths of your imagination for the most creative and out-of-the-box solutions. Does the Switch version come with Mario and Zelda characters? I'm surprised that touch screen support isn't available; I've watched reviews on YouTube which suggested that it is available in portable mode. @Lasingd Thank you, I had thought that you could! I wonder if Nintendo Life will update the review? @Lasingd @jawafour I've got Dom to check, and touch support is indeed there - but buried in a settings menu. I've edited the review to reflect this. @jump I believe it download-only at present; I can't see anywhere selling it in cart form but I think that it may appear further down the line; although getting confirmation of that seems to be difficult. Personally I'd prefer a cart so I may hold off and wait. Like we don't have enough ports ? @Damo Thank you! It seems that touch-screen support could be far quicker and intuitive to use than the letter-wheel option so I'm glad it is in place . I'm not sure there's a problem in DC Universe that cannot be solved by applying Lobo to it. @Cobalt They did make a new one and it was awful. For anyone new to the series, the fun doesn't come from "solving" puzzles (spamming "jetpack is usually enough). It comes from solving puzzles with the most absurd items you can imagine. Doing this with a group of players around the console makes it more fun. "I'm not sure there's a problem in DC Universe that cannot be solved by applying Lobo to it." @The_Mysteron Lobo is a DC Comics character, an interstellar bounty hunter/merc who flies around on a space chopper and kills "geeks" with either oversized guns or a hook on a chain. Basically DC's Deadpool, except he came first and is in space (and not as much of a goofball, even if the comics aren't very serious). Definitely grabbing this after Xmas. Love the series, and itll be nice to have it on the go. I put way too much time into the DC version on my 3ds just goofing off. I know I'll do the same on my switch. Can anyone tell me if the Nintendo characters included in the WiiU version are in this version too? I hope they release Super Scribblenauts too. I played that one far more than Unlimited because the levels were linear and that allowed for more replayability. 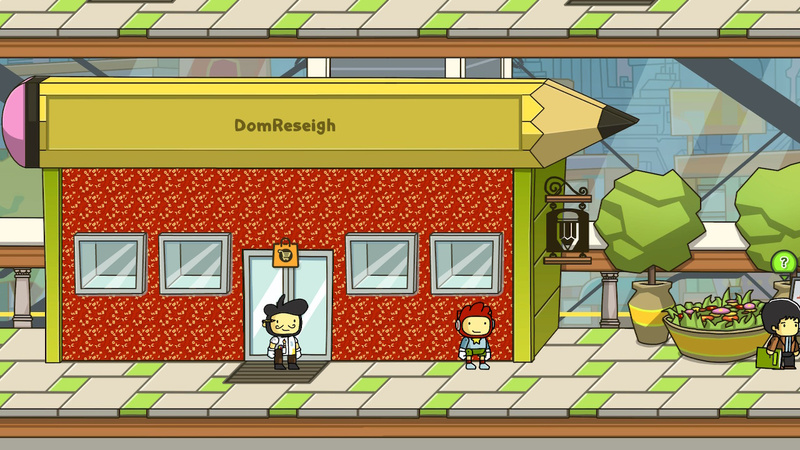 Also 'rideable Pa' is the greatest combination in Scribblenauts history. Got these one last time at 70% off for my Steam account. No need to ever buy them again. I never did play unmasked... might get this if it goes on sale. Having a Switch version of Unlimited would just be a bonus. I'm going to wait for the price to drop (it will) but I do want these on the go. @Cobalt in 2019 man... just give up on what is left of the 2018 Switch launch schedule. Unless you reaaaaaally like fighting games - nothing to see here. You will have a much easier time next year. But to be honest, even 2019 seems to be kind of dry... at least for the moment. I have one big game a month till March 2019. So they still have time to get their ducks in a row. I open these next to each other to decide my gaming schedule. Maybe it can help you plan ahead once we in 2019. @jump @jawafour No it's not download only but it's only available online everywhere I've seen. Checked Best Buy, Target, Walmart, and Gamestops site to see if it was available for pickup and it just said it's only shipped/ not available at this time, so mine is shipping to my house from Best Buy tomorrow. @Cobalt 2019 is actually looks really solid compared to this year, at least in terms of big games that sell well. Mainline Pokemon and Animal Crossing are some of the best-selling (if not the best) selling games on the 3DS and both are coming next year. Add more titles like Luigi's Mansion 3 Yoshi, Fire Emblem, Daemon X Machina, NSMBU, Travis Strikes Again, and 3rd party games like Shovel Knight King of Cards, Team Sonic Racing, and Trials Rising. If you can't find anything you like you there are in the very small minority. Plus Metroid Prime 4 could come next year as well. @BezBot said :" Mainline Pokemon and Animal Crossing are some of the best-selling (if not the best) selling games on the 3DS and both are coming next year. Add more titles like Luigi's Mansion 3 Yoshi, Fire Emblem, Daemon X Machina, NSMBU, Travis Strikes Again, and 3rd party games like Shovel Knight King of Cards, Team Sonic Racing, and Trials Rising. If you can't find anything you like you there are in the very small minority. Plus Metroid Prime 4 could come next year as well." Yoshi I can't wait to play it !!! Travis Strikes Again WHAT A JOKE ! So yeah, Yoshi for me without any doubt. The other titles hummm for the moment it's no ! @Cobalt I understand you might not like the games but Pokemon and Animal Crossing nevertheless are system sellers, more than any other game this year besides maybe Smash (but both Pokemon and AC still sold better on 3DS). So in general for the Switch with all those games it is definitely not dry and will be very good financially and in the public eye. This is awesome. One game I did not purchase on Wii U and I get to play it now. Two games! @Cobalt not sure if you'd qualify it as a port or not, but I'm looking forward to V-Rally coming to Switch sometime after it launches for the other consoles. That kind of thing is set to increase now that the Switch is proven to be capable and popular. Does anyone know if Unlimited contains the Nintendo characters and items that the Wii U version originally had? Seen a lot of comments asking if it has Nintendo characters - I'm afraid it does not, weirdly enough. However, there's always the ability to download items that other people have made from the store.